← NO MORE Eiga Dorobou! Video and watercolor! Today’s Watercolor: Bee & Puppycat! 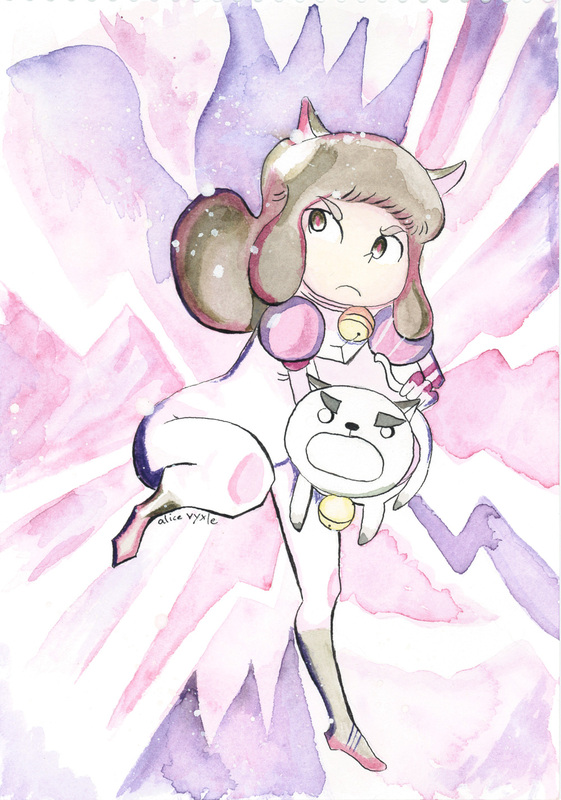 This watercolor is based on the animated short Bee & Puppycat from Natasha Allegri (one of the artists from Adventure time, who also created the gender-bent Fionna and Cake spinoff.) It’s a little bit weird, but lots of fun! There’s lots of influences from things like magical girl shows and what not. Speaking of influences, this design was based off some awesome fan art done by nodinner over on tumblr. Thanks for making such an cool piece, nodinner! And thanks to Natasha Allegri, too, of course! This entry was posted in Art and tagged adventure time, bee and puppycat, I made this, I painted this, my art, natasha allegri, watercolor, watercolour. Bookmark the permalink.